This Is The Home Of The Lady Mustangs, We Are A San Antonio Team That Has Been Together For About Three Years. These Young Ladies Are 12-13 Year Olds, Who Have A Great Deal Of Love For The Game Of BasketBall. 2007 is here and another new year of Basketball. The girls are in the mist of getting ready for the 2007 YBOA Qualifier. These ladies are hoping to sweep the competition so that they can once again make there way to Orlando Florida for National Competition. Our Lady Mustangs have many new editions to our team along with the expanation of the Lady Mustangs. We have now added a 93 team to our Organization, Which consists of some 13 year olds, and a few of our 94's. We are planning on having a great year for both our teams and we will be competing in Corpus Christi for Nationals with our 13 - under. 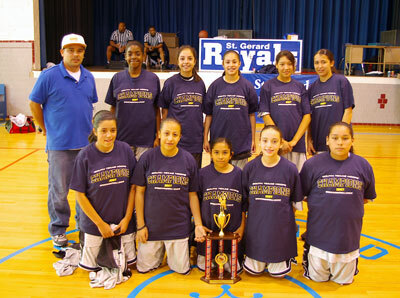 The girls competed in the South Texas Hoops Spring Championship for 12-under girls and once again came out victorious. Great job ladies, we are all so proud of you. This was a great undefeated season the girls also competed in the South Texas Hoops 14-under league and fell just shy of 1st place our 13-u and some of 94's played a tough game against the Ballerz and lost the Championship game by 1 point. Tough Break girls but we will get that 14-u Championship next season. Well time once again has come to get ready for Nationals. These ladies will be doing fundraisers almost every weekend along with tournaments from now till July. Anyone out there that would like to help our team out with a donation can contact me. We are a non profit organization and can be used as a tax write off.